Tools for wellbeing, ‘Scapes: Rose Quartz’, 2018. Rosequartz crystals, pink opals, acrylic perspex, silicone, glazed earthenware, bisque fired earthenware, powder coated steel, marbled fabric, photographs, airplants. This exhibition, titled ‘Scapes: Rose Quartz’, presents itself as a sculptural intensification of objects that speak of a deep human faith in the power of the things around us. 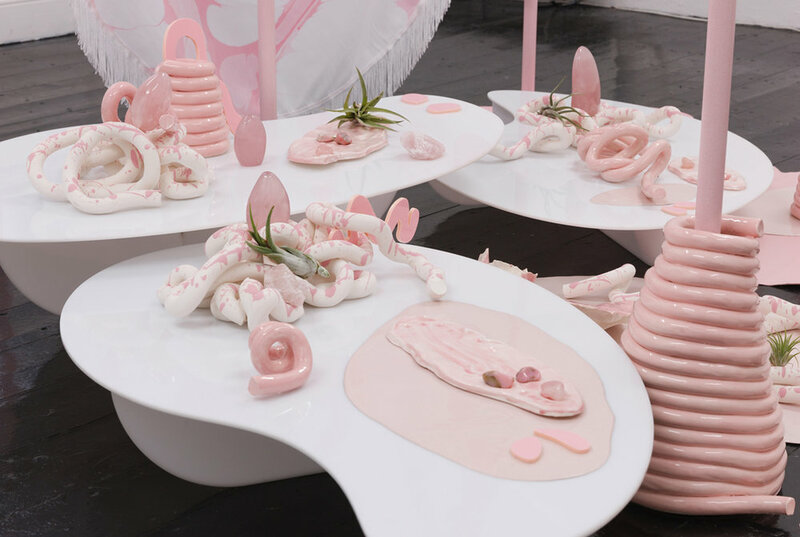 The work operates in an aesthetic register of excess and material over-fullness, expressed through the inter-related accumulation of individual objects, a super-saturated pink colour palette, a sense of plentitude and amplification, and an identification of the sensuality of things. ‘Scapes: Rose Quartz’ is the first episode in a series of sculptural arrays by the artist gathered under the banner Tools for wellbeing. Tools for wellbeing springs from an intrigue for moments where the human body and other matter, such as crystals, stones, oils and plants come into proximity for the purposes of healing and wellbeing. It proposes the zone of the artwork as a holistic moment where relationships with, and between matter can be discovered; a portal where affective exchanges and encounters are allowed to take place. Barbara Knezevic lives and works in Dublin. Her work is primarily object-based, finding form as complex stagings and formations of objects that are occasionally foregrounded by photographic works and moving images. Her practice concerns itself with the volatile material and interpretive relationships involved in art-making, the language and nature of materials, the codes of display and exhibition, and the ways in which artworks are represented, archived, stored, traded and discussed. Her artworks and formations describe the peculiar human relationship to the things around us that is often typified by our relationship to the art-object; our treatment of matter or ‘things’ as agents, commodities, tools, proxies, artefacts, aloof matter and models for representation. Knezevic’s recent exhibitions include: The Irish Museum of Modern Art Hennessy Art Fund (2018), Exquisite tempo sector a solo exhibition at Temple Bar Gallery and Studios (2016), The Last Thing on Earth, a solo exhibition at the MAC, Belfast (2016), City Agents, curated by Jussi Koitela, at EKKM, Estonia (2016), With Leftover Agencies, Gallery Augusta, Helsinki (2016); Duality of Form, Solstice Arts Centre (2016).